Have you receive unsolicited text messages asking you to input a certain digit and to send it in a number that starts with “2”? 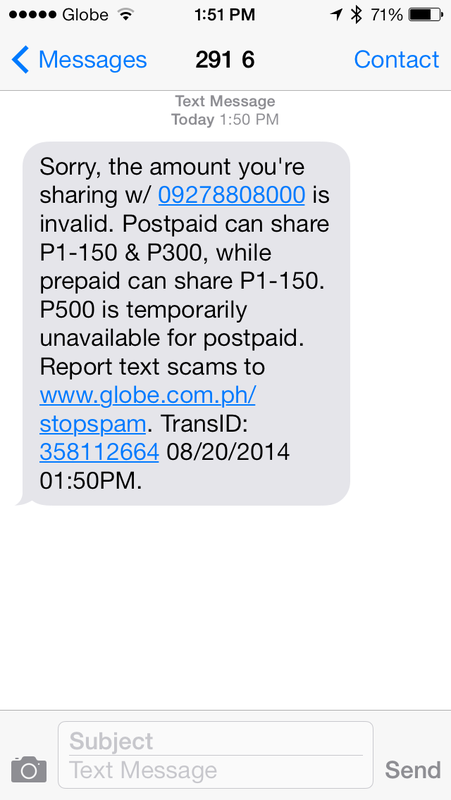 These messages are flagged as scam messages due to the fact that the whole scheme stated above is Globe’s Share-a-Load process. Due to this, Globe Telecom puts in place more stringent measures to curb text scams and prevent customers from being victimized in share-a-load transactions via SMS. Starting early August, Globe set up a system which limits the amount of share-a-load transaction to a maximum of P150 or prepaid customers and P300 for postpaid customer. This system helps postpaid customers from sharing P500 in load credit. As an added measure, customers will be given the choice to confirm their transaction through a validation text asking customers if they are sure about doing a share-a-load. The validation text will be implemented starting September 8. Globe has put these measures in place based on reports from its customers about the varying text scams using spiels like rewards, loyalty, MSF discount, roaming and bill overcharge, waiver of charges, refunds, etc. “The new measures will help protect our customers from being victimized by text scams. It is equally important for our customers to be aware that by adding the number “2” before the 10-digit mobile number of the recipient, they are doing a share-a-load transaction,” said Yoly Crisanto, Globe Senior Vice-President for Corporate Communications. Following the telecommunication company’s intensified efforts to combat text spams and text scams early this year, the number of reports using the website has reached over 42,000 since it was created last June 2014.